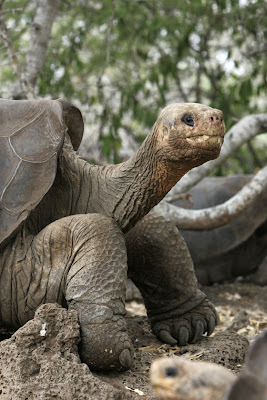 Talk about critically endangered, Lonesome George, of the Galapagos, is the sole survivor of his species, Pinta Island Tortoise (Geochelone elephantopus abingdoni). He has been all by himself since 1972 when they brought him to captivity at the Charles Darwin Research center so they could protect the last animal of the Pinta Island species. 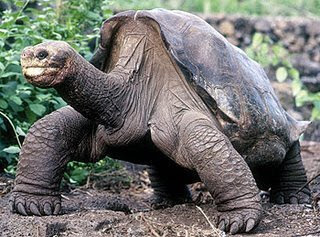 After nearly 40 years by himself, they belief they may have found one of Lonesome George's half brothers, a first generation hybrid another species of native tortoise and the Pinta Island Tortoise. This brings hope that they might be able to find a good mate for George so he can pass on his genes. For more information you can read the full story here. 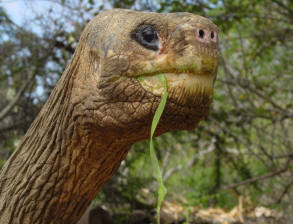 To see how you can help Lonesome George and other Galapagos tortoises visit: The Charles Darwin Foundation website.